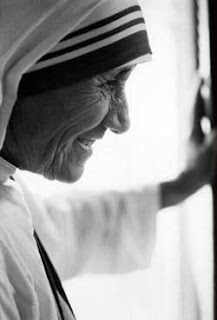 Whispers in the Loggia: "Give God Permission"
Today marks the feast of the woman who's arguably the most-hailed witness of the last century: Blessed Teresa of Calcutta -- Mother Teresa, whose own "little way" continues to fascinate, inspire and draw the masses even 11 years after her death. Appropriately enough, this weekend's second reading perfectly encapsulates the work of the "Saint of the Gutters": "Owe nothing to anyone, except to love one another; for the one who loves another has fulfilled the law." Originally brought to prominence in the writings of an earlier 20th century saint of the same name -- the "Little Flower" Therese of Lisieux (whose parents will be beatified next month) -- thanks to the examples of both, the simple concept of doing "little things with great love" has become a guiding principle of life for countless folks the world over, and it's not hard to see why; as with every other great export of the Catholic tradition, it's a call that's simple, universal, uplifting and accessible to one and all, regardless of background or situation. Born in Albania, she became a daughter of India and a reference-point for the world, a spiritual figure whose voice bore a credibility and influence that transcended religious and political divides, a physically slight figure but a giant on the world stage, the Nobel Peace laureate who lived most of her life in poverty, always close to the earth, and was without fail most at home with the people who were her life -- the poorest of the poor. But even so, for most of us, following her example -- and, by extension, that of the One who sent her -- won't entail leaving everything we have and crossing the globe; then again, it won't have to. As an old song once put it, "there's a world outside your window" (indeed, just inches from our respective monitors) that, maybe now more than ever, longs for a bit more presence, a bit more joy, a bit more hope, a bit more love... and regardless of where we're at or whatever situation life finds us in, the answer, the giving, the change, begins with each one of us. Nakedness is not only for a piece of clothing; nakedness is lack of human dignity, and also that beautiful virtue of purity, and lack of that respect for each other. The more you have, the more you are occupied, the less you give. But the less you have the more free you are. Poverty for us is a freedom. It is not a mortification, a penance. It is joyful freedom. There is no television here, no this, no that. But we are perfectly happy. It is a poverty to decide that an unborn child must die so that you may live as you like. You and I, we are the Church, no? We have to share with our people. Suffering today is because people are hoarding, not giving, not sharing. Jesus made it very clear: "Whatever you do to the least of my brethren, you do it to me. Give a glass of water, you give it to me. Receive a little child, you receive me." Clear. Only in heaven will we see how much we owe to the poor for helping us to love God better because of them. Despite giving your best to the world, you may be kicked in the teeth. Give the best you've got anyway. Make us worthy, Lord, to serve those people throughout the world who live and die in poverty and hunger. Give them through our hands, this day, their daily bread, and by our understanding love, give them peace and joy. Well, let's do something beautiful for God. Easy words, sure, but -- as with everything else in this life -- the easier it sounds, the harder it is to carry out. Then again, as she once put it herself, "Yesterday is gone. Tomorrow has not yet come. We have only today. Let us begin." And so, church, let us begin... and where it's begun, keep it up. to minister to Christ in his suffering brothers.